What I learned is that the German and Austrian researchers had a very different hypothesis of obesity than we do. We think that obesity is caused by taking in more calories than you expend. It’s an energy balance. I’m just curious how many of you believe that to be true. You know, you eat too much and you’re sedentary. The counter argument is that the Germans and Austrians had come to the conclusion that obesity is a hormonal defect. Back in the 1920s, obese people would say, “Well, it’s hormones.” And it was considered an excuse even back in the 1920s before any hormone but insulin had been discovered. People had no idea how hormones work in the human body. The medical community would say this was an excuse for fat people to not eat in moderation like lean people would. This idea, built up through the 1960s, was hammered on over and over again. It can’t be a hormonal defect; “fat people just don’t have willpower like I do”, was the implication. Anyway, World War II comes along, the German and Austrian schools vanish. Some of these researchers fled to the United States but they didn’t get jobs because nobody wanted to hire these German Jewish researchers; certainly not Ivy League institutions, which actually had protocols in place so as not to be overrun by Jewish admissions and Jewish students. In fact, a lot of them ended up moving west, and it’s one of the reasons that places like Washington and Berkeley, where I live, are such great universities because they embraced these people. This idea that obesity was a hormone regulatory defect evaporated with the Second World War. After the war, very well-meaning US nutritionists and young doctors sort of recreated the science of obesity from scratch with no idea how to do science and no understanding of endocrinology or genetics or metabolism and even profoundly, nutrition. They ended up with this idea that it’s just about eating too much. Gluttony and sloth. It was like a Biblical theory of obesity. In the 1960s when researchers started to understand what it is that actually regulates the accumulation of fat in your fat cells, by that time we had already decided that obesity was an eating disorder caused by taking in too many calories. Nobody cared what the endocrinologists were learning about obesity. Ed: We’re at 16:36 minutes. I was doing a BBC TV show in which they were interviewing me in Oakland via Skype. The host of the BBC show was a geneticist who studies obesity at Cambridge University. He studies the genetics of obesity. He got a little angry at me because I kept asking him questions when he wanted to ask me questions. One of the questions I asked him was “Do you know what regulates fat accumulation in fat cells?” And he said, “Well, we don’t know that.” And I said, “No, you don’t know that because you studied genetics.” But if you pick up an endocrinology textbook or a biochemistry textbook, it’ll tell you about the hormone insulin, [and it will] tell you what enzymes are in insulin that regulate and pull fat in or out of fat cells. Anyway, this whole story ties back to sugar. If obesity is a hormonal regulatory defect and if it’s more or less controlled, as the endocrinology and biochemistry textbooks will tell you, by the hormone insulin, then whatever works to elevate insulin in your bloodstream is going to make you accumulate excess fat; that thing happens to be sugar. My Comments: Sugar and the other refined carbohydrates in our processed-food diet is one of our major health problems. Anyone who writes and knows anything about nutrition warns us about this problem. William Dufty in Sugar Blues described his battle with sugar addiction and how destructive sugar was for his health. Dr. Stephen Sinatra in Chapter 4, Sugar: The Real Demon in the Diet of The Great Cholesterol Myth writes as to how sugar contributes directly to heart disease. The problem for us is the pervasiveness of sugar in our diet. Even in things touted as being good for us such as “organic” can be remarkably high in sugar. A client recently told me about her favorite bread, Dave’s Killer Good Seed Organic Bread with the yellow wrapper. The nutrition information indicates 5 grams of sugar per serving with one serving being 140 calories. 5 grams x 4 calories per gram = 20 calories per slice. 20/140 reduces to 1/7, meaning that around 14% of the calories are sugar. Obviously, a loaf of bread such as this is light years better than white foam bread, however it is still a hidden source of sugar. To Dave’s credit, some of their other lines have less sugar. Continuing: Again, it’s targeting this condition of insulin resistance. If you’re insulin resistant, your pancreas has to pump out more insulin to make take up the high blood sugar in your body and deal with it. Basically, you have a very strong chain of effects that would implicate whatever is the cause of insulin resistance, obesity, and diabetes. Again, I think it’s vitally important in doing this story to understand the history. 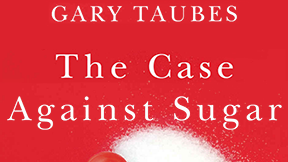 So much of this book [ he is referring to his book, The Case Against Sugar.] is about the history. I’m also saying in 2016 we’ve missed the story. So, I’m making this argument that the nutrition community got it wrong, the obesity community got it wrong despite the anti-sugar movement. The question is: why is the anti-sugar movement about sugar being empty calories if we consume an excess, whatever that means. Nobody ever says lung cancer is caused by smoking in excess, right? You say it’s caused by smoking. But we’ll say obesity is caused by consuming foods in excess. Is it just caused by consuming foods, just as lung cancer is caused by smoking? What I had to do with this book is explain why such a profoundly important hypothesis had been ignored. Something I argued time and again is that the evidence is actually ambiguous. I’m speculating by saying sugar causes all these diseases. Why is it in 2017 I have to speculate we haven’t done the research necessary to narrow it down. The other part of the story is how the sugar industry worked in the 50s, 60s, and 70s to take what the nutritionists were giving them and make sure no one ever concluded that sugar was uniquely toxic. This is not a short-term toxin like we’re used to, like a chemical which might kill you if you inhale it for three weeks, but a long-term toxin that works over years and decades to create these chronic conditions, diseases, and disorders that are so burdensome, and will eventually shorten your life like no other. My Comment: This is why so many people find it difficult to realize that their stent placement, obesity, stroke, cancer, or heart illness is the result from past decades of nutritional abuse. I have been in homes and seen processed, sugary junk foods sitting on people’s kitchen counters. Invariably they are taking several meds for blood pressure, heart regulation, and/or type 2 diabetes. They also tend to be overweight. Continuing: Much of what I do in this book is also to talk about the history of the sugar industry and their public relations campaigns. They ran concerted campaigns in the 60s and 70s, first to fight back the challenge that artificial sweeteners presented in the 60s. It’s funny because people like to say it’s a surreptitious campaign by the sugar industry, but I first realized this happened because I was reading a New York Times article. It wasn’t a surreptitious campaign, it was just capitalism at its best. Artificial sweeteners came into the market in the 1950s. By the 1960s they were taking over the soda industry and the sugar industry felt they had to fight it back. So they did. They funded studies and they got cyclamates banned, and they almost got saccharine banned based on science that was almost unbelievably bad. In the 1970s, when a very influential British nutritionist named John Yudkin was claiming that sugar was deadly and that it was probably the cause of diabetes and heart disease, the sugar industry funded a campaign of researchers who believed saturated fat was the problem. Comment: Weren’t they clever by scapegoating saturated fats? Continuing: The nutritionists and cardiologists in the United States had concluded that saturated fat was what caused heart disease, and if it caused heart disease, then it caused diabetes. All they had to do was pay the nutritionists to stand up and write what they really believed. What they believed was that sugar was benign. One thing led to another, and the end result was that they managed to, in effect, shut down sugar research in the country for about thirty years. In fact, by the mid-1980s, for someone to say sugar might be harmful and to study it, was to be accused of being a quack. It wasn’t just that the NIH wouldn’t fund such studies, but it would actually ruin your reputation as a scientist if you claimed to do it. 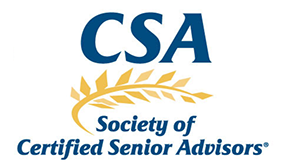 I have been a member of the Society of Certified Senior Advisors for several years and receive their publications both in print and online. Their recent article, Busting the Top Five Medicare Myths, caught my attention. I have paraphrased these myths below and added pertinent comments as necessary to fit our five states of ID, MT, OR, WA, and WY. Please click here to review the article in its entirety. Myth 1: I can enroll any time I want to. One of the biggest misunderstandings about Medicare supplement (Medsupps) concerns the Annual Election Period (AEP-also known as Medicare open enrollment) that runs from October 15th through December 7th. For additional information, please refer to our companion article in this issue titled Have Your Medicare Supplements Rates Gone Up? I have heard this statement over and over: “Oh, I thought you can change your Medsupp during open enrollment (meaning the AEP).” The AEP is all about changing your Part D prescription plan (PDP) or your Medicare advantage (MA) plan. It has very little to do with Medsupps. In Idaho, Montana, and Wyoming, you can change your Medsupp any month of the year subject to medical qualification. There is another twist to this. If you have been on a plan that disenrolls you, such as an MA plan, then you can use the guarantee issue rules to sign up for Medsupp plans A,B,C,F,K, and L with NO medical qualification. Guarantee issue, means just that, your acceptance is guaranteed, even if you have a substantial health issue such as a recent heart attack. Myth 2: Medicare pays for long-term care. Medicare covers 20 days at 100% for skilled nursing facility care after a medical event such as a stroke or hip replacement. Medicare will cover another 80 days, subject to fairly strict qualifications. There is also a $164.50 per day coinsurance (in 2017) which most Medsupp and MA plans cover. Myth 3: Medicare covers all my health expenses. Congress passed the Medicare legislation into law in 1965 to keep seniors from being financially wiped out due to high medical costs. That was the purpose for the original legislation. Over time, more things have been added such as preventative procedures and home health care. Medicare was never intended to cover dental, routine vision care, cosmetic surgery, and custodial care in a nursing home. Myth 4: Medicare is free. Most native-born people receive Medicare Part A hospitalization at no cost. Part B, medical, has a premium in 2017 for new enrollees of $134 per month. People in higher income brackets have higher Part B premiums. Myth 5: I don’t need to enroll in Medicare. There is no one pointing a gun at your head saying that you MUST enroll in Medicare Part B or else. However, it’s a smart idea to do so. The CSA website article gives some tips for those that are on an employer plan. That penalty means premiums can go up almost 10 percent for every month you are eligible for Medicare but not enrolled. Conclusion: The error in Myth #5 is a good example of how a single word mistake can cause misinformation. Sadly, this is all too prevalent in much of what you hear on the street, from the senior center, the news media, and even from supposedly knowledgeable people such as the Council on Aging. Where do you go to obtain accurate information? Medicare.gov is an excellent source. Additionally, AARP also has lots of good info about Medicare. In our Have Your Medicare Supplements Rates Gone Up? article we discuss what you can do if your rates have gone up. In this companion article, we talk about the two main causes of these increases. Think of them like two rivers that come together to form a larger one. In this case, your premium increases 3.5% beginning at age 66 and every year thereafter. Some companies end their attained-age increases at age 80, and others go to age 99. Everything else being equal, I would choose Company Y over Company X for someone signing up at 65. Just because a state’s insurance department allows attained-age pricing, doesn’t necessarily mean that all companies use it. A company at its own prerogative may choose issue-age pricing instead. Issue-age pricing means that if you sign up for a Medsupp at 65, let’s say with Company Z, you are always in the 65 year-old rate category. Since you are issued at age 65, your premium does NOT increase just because you advance in age. Company Z’s rate chart may look like this. If you come in at age 69, for example, your premium will be $129.79 per month, and then you will always be in the 69 year-old group. Here’s the breakdown of how attained age pricing (if allowed) works in the five states we work in. Idaho: An Issue-age state. Does not allow attained-age priced policies. The premiums typically start around $20 per month higher compared to attained-age pricing. Montana: An attained-age state. Virtually all companies use attained-age pricing. Many of you have a company that is the exception and uses issue-age pricing. Oregon: An attained-age state. All companies that I know of use attained-age pricing. Washington: A community rated or flat-rate state. 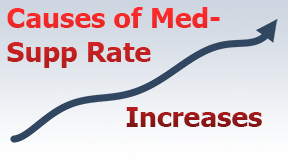 Each companies’ Medsupp plan letter has its own flat rate. It doesn’t make any difference for smoker or non-smoker, your age, or male vs. female. The rate is flat, period. Plan G’s might run around $180 per month. Wyoming: An attained-age state. All companies that I know of use attained-age pricing. Here’s the bottom line. Many people in Montana (but not all), Oregon, and Wyoming will have attained-age rate increases. Idaho, Washington, and those in Montana with an issue-age policy do not. However, the trade-off is that premiums usually start higher. Note: One company in ID, MT, OR, and WY has its own unique pricing structure, which functions similar to attained-age pricing. Cause #2: All Medsupps eventually increase in premium due to the claims experience that any given company incurs. Let’s say Company W offers Medsupp plans F, G, and N.
As far as claims and premiums go, the people on Plan F are in one bucket, the people on Plan G are in their own bucket, and the Plan N folks have their own bucket. Premiums are money going into the bucket, and claims experiences (losses) and administrative expenses are money going out of the bucket. Let’s say that the policyholders in Company W’s Plan F bucket as a group, begin to have more medical procedures. For example, John Doe has an unexpected open-heart surgery and Jane Doe starts a chemo therapy regimen after a mastectomy. Those two cases will incur substantial claims for the company and cause more money to flow out of the bucket. Let’s say that there are also other Company W policyholders that increase their medical utilization of their Medsupp plan. The losses mount. Finally, it gets to the point where Company W goes to the State Insurance Department, documents their increased losses, and files for a rate increase. If it’s 6%, for example, then everyone in Company W’s Plan F bucket goes up 6%. It makes no differences whether a policyholder has huge bills and another has had no claims at all. If the premium increase is 6%, then everyone goes up 6%. As the people in any company’s block of business begin to age (I hate to put it that way, but it’s the truth), the claims experience inevitably increases. The older standardized plans purchased prior to June 1, 2010 are all closed blocks of business and have increasingly greater rates of claims experience. That has put more pressure on rates. More claims experience = more losses = premium increases. There is another tributary to the Claims Experience River, the North Fork. When Medsupps were initially offered, beginning in 1966, most plans covered the Hospital Part A deductible, just as most plans do today. In 1966 the Medicare Part A deductible was only $40. It wasn’t too long ago that it crossed over $1,000. In 2016 it was $1,284, and in 2017 it’s $1,316. It likely will be pushing $1,350 in 2018. Each year, as a policyholder is hospitalized, Company W has to pay out more money in claims. Even if the rate of hospitalizations is the same on a per 1,000-policyholder basis, the insurance company continually has to pay out more money. Other Medicare deductibles and co-insurances also increase. As the Medsupp company continues to pay its own share of the costs, it has to pay out more and more every year coinciding with the increased obligations from Medicare. In fact, the companies usually send their policyholders a notice in the fall stating that they will automatically cover Medicare’s increases. To sum up: As the company’s block of business ages, you have increasing medical utilization as well as gradually increasing deductibles and co-insurances from Medicare. Both of these flow together causing more losses for the insurance company, and unfortunately, this ultimately leads to claims experience rate increases. Conclusion: Both attained-age increases (OR, MT, and WY) along with increased claims experience (losses) will cause your Medsupp premiums to go up. The increases in ID and WA are due to claims experience only. While that’s nice for those two states, keep in mind that their rates start higher from the get-go. What can I do to find lower rates? 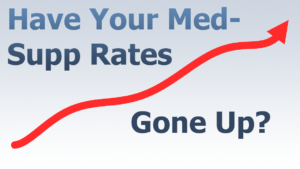 Please refer to our companion article, Have Your Medicare Supplements Rates Gone Up? In addition to shopping for lower rates in general, sometimes switching from a Plan F to Plan G or Plan G to Plan N can be a smart more. If you have an older plan that has had substantial rate hikes and your health is stable, the chances are good that we can qualify you for lower rates.